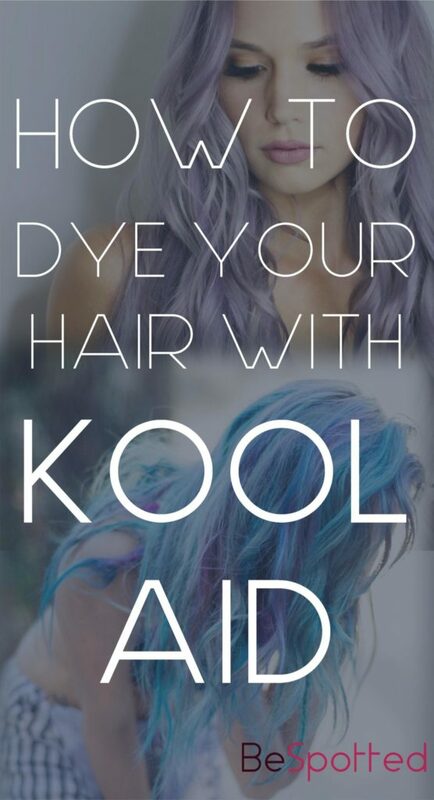 Home > Hair > Would You Dye Your Hair with DIY Kool Aid Hair Dye? For years now girls have been using powdered drink mixes to dye their hair. But lately it seems it really became a thing. Kool Aid hair dye is a super easy, fast and cheap way to bring life and fun into your hair, especially if you are brave enough to use bold, vibrant colors. Dyeing the hair with powdered drinks is better for those who don’t plan to dye the whole hair. (Though, congrats to Tabby from Tabbyofficial. You can check in the video bellow how amazing her hair looks). Still, more often than not it looks better if you use this technique to dye only sections of your hair or maybe the ends. You can use only one color or a couple of different colors, for a unicorn effect. Hair dyed this way tends to look better if you dilute your Kool Aid hair dye with enough of a hair conditioner to get pastel hues rather than too bright ones. Now, the color should stay in your hair for 2 – 3 weeks, but many girls reported they couldn’t get rid of the color even after a whole year! So, make sure you really, really want to do this before the sudden strike of inspiration makes you dip your hair into the color. I know my own inspiration has never been a reliable source of reason. Kool Aid hair dye works especially well if your hair has been bleached. On the darker hair it can be hard to get the hue you want. It would be best to first dye only one section of your hair, the one that you can easily hide. This will give you the right idea of how the color will look. You can also check if the hue you chose works well with the rest of your hair and with your skin tone. And if it turns out you hate it, you can just cover it with the rest of your hair. After that, making your own Kool Aid hair dye is pretty simple. Start with 2 – 3 packs of Kool Aid. The exact amount depends on the length of your hair and, of course, whether you’re dyeing your whole hair or just sections/ends. You can use just one color or mix and match to get completely custom and unique Kool Aid hair dye. Add just enough hot water to dissolve the powder. Add a little bit hair conditioner and mix well until you get a paste. If the color of your mixture looks too intense, you can add more conditioner until you get just the hue that you want. Apply your Kool Aid hair dye to all the sections you want to dye. Be careful with it – this thing makes a mess! So, old t-shirt, old towels… you know the drill. Leave it on for 40 – 60 minutes, then rinse it out (do not use shampoo). Want to see how the procedure actually looks like? tabs24x7Official made a great video for you.